This History of the Surrey Dyking District is based on a report, dated October 25, 1992, by Frank McKinnon, Ex–Clerk and Collector for all three Dyking Districts. The report has been updated by the Surrey Dyking District's Kathy Zeilsta, and made available by Gordon Bishop, a retired Surrey Dyking District employee. All the pictures used in this history have been provided by Gordon Bishop. The Surrey Dyking Commission was formed under a provincial statute in 1911. The Nicomekl and Serpentine rivers, which run through Surrey and Langley, both flow into Boundary Bay. 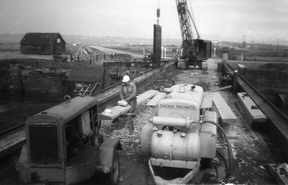 The Dyking Commission's initial mandate was to install dykes and two tide flood gates on the rivers. The ultimate objective was to reclaim 10,500 acres of prime agricultural land. Presently the Dyking District maintains 40 miles of river channels and dykes as well as the two original tidal dams. Diking has long been a major problem faced by the farmers of the Serpentine–Nicomekl lowland. 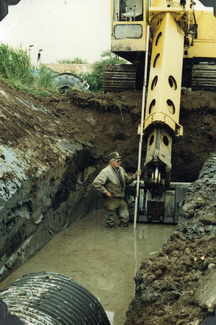 Initially all dikes were built with hand labour, and some of them reached three feet in height. 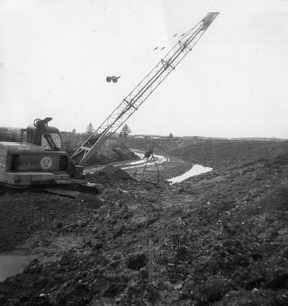 The first machine–made dikes were put in, in 1898, on the north bank of the Nicomekl from the Semiahmoo Road Bridge, around Mud Bay and up the Serpentine to the Woodward farm and the Semiahmoo Road. 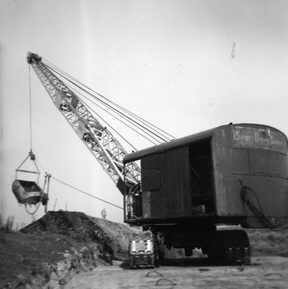 The dredge was a floating rig that took material from the river bottom for the construction of the dike. The picture on the left is of Gordon Bishop in the cab of his drag line. The picture was taken in July 1978. The Surrey Dyking District was originally established in 1911 under the Dyking Ditch and Drainage Act of the BC Legislature by landowners in the Nicomekl and Serpentine Rivers' bottom land. This area having an elevation of less than four feet above geodetic zero (sea level), from Elgin Road to Langley's border on the Nicomekl River and from Elgin Road to 88th Avenue on the Serpentine River. The reason for the formation of the Surrey Dyking District was to provide a taxing authority to enable the construction of a dam across each river with six sets of tide activated flood–gates plus the raising of the Elgin Road from Crescent Road to Woodward's Hill. The Serpentine Dam was 162 feet long, while the Nicomekl was 230 feet. Each had five arched, 10 feet wide tunnels with gates; one over 20 feet wide to accommodate boat and barge traffic. Built in 1912 and 1913, costs for these structures totaled $165,000. This did not include the cost of raising the height of the Elgin Road which was not done until 1921. The entire scheme was financed by a $15,000 BC Government Grant, a $135,000 debenture, a $5,000 bank loan and a $15,000 tax levy. 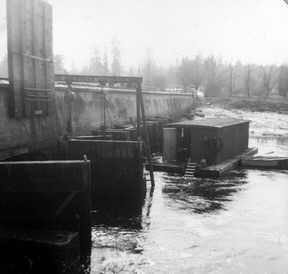 When the dams were constructed with their tide activated gates, it was necessary to hire a caretaker to make sue that logs did not block the gates. This required an employee to visit each dam twice a day whenever the tides changed. Abraham Dinsmore took on this thankless task for $50 a month and kept the job for almost 20 years. Another local dyking landowner, T. W. Hardy then took over and carried on until 1963 when the provincial government installed log catching booms across both rivers. The whole scheme was envisioned and designed to keep out the sea water that daily flooded much of the area. 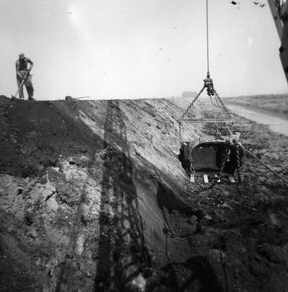 The drainage area as estimated by the engineers in the 1930's and 1940's was 65,000 acres. No thought was apparently given to the potential flooding from upland water. These are the names of the proprietors who selected the first Surrey Dyking District Commissioners. The first Commissioners of the Surrey Dyking District, elected by the proprietors listed above, were Henry Bose, B.B. Smith and T.J. Sullivan. In 1915 Charles A. Carncross was contracted to act as collector at 3% of the taxes collected and was required to post a surety bond of $2,000. This was a common practice for many years. J.J. Brown of Surrey Centre was appointed Commissioner in September of 1921 to replace Tom Sullivan who had resigned when he was awarded a contact for dredging. The tax levy in the Surrey Dyking District in 1913 was .91 per acre. In 1922, it was up to $1.27 per acre. By 1946, the rate had jumped to $3.00 but dropped steadily over the next decade. In 1960, it rose to $2.50 and gradually up to $4.00 in 1988 and $5.00 per acre in 1992. Currently the 2007 the tax rate is $7.50 per acre for Class A lands. There is a minimum charge of $50 per legal description. 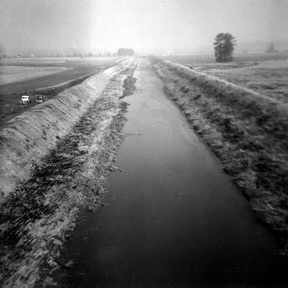 In 1921 the landowners with the Surrey Dyking District who lived north of the BC Electric Railway and whose land drained into the Serpentine, petitioned the Commissioners to dredge the river and the canal from the BCER to 88th Avenue. They all signed a contract agreeing to have the soil deposited on their lands in order to make a dyke and also agreed to pay for this work through a separate tax levy within their section of the Surrey Dyking District. T.J. Sullivan won the contract with a bid of .49 per cubic yard. The total cost eventually came to $48,000. The Commissioners also asked Victoria for assistance and received $10,000 which they thought was a grant. Only later did they realize that this assistance was a loan, not a grant. The provincial government did agree to finance the project at 5-1/2% of the cost but required a mortgage on tax right and a lien was registered on every parcel of land in favor of the Land Settlement Board. Repayment called for the interest in full plus $12,000 annually against the principal. In the Dirty Thirties the landowners voted not to levy the extra taxes and not to pay anything more on the loan which is why 60 years later this lien is still on every parcel of land in the Upper Serpentine Area. These pictures are of the Surrey Dyking District crews dredging the Serpentine River. On the left, Gordon Bishop is operating the Byers Drag line. On the right, Sivert Thune is directing operations from the top of the dyke. This section of the Serpentine is near 168th Avenue. After 1957 the dyking district began regular dredging of the rivers as a result of silting from the development of the uplands. On the left, blue clay stored from Cloverdale's installation of a sewer system and is used to seal the dykes. 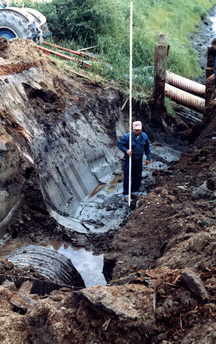 On the right a trench ditch is dug and filled with blue marine clay to seal the dykes and prevent them from leaking under the pressure of high water. A Vicky Parr interview: with Harold Gordon Bishop, February 5 and 13, 2007. Gordon says that at one time, the Commission used to dredge the river to get the blue clay to build the dykes, but the clay is now collected from various housing projects in the highlands nearby and road construction projects and stockpiled until the summer when it is used to build up or reinforce the dykes. The blue clay has the consistency of plasticine and never hardens when it is wet. It creates an impervious barrier that resisted dyke leakage. In 1921 repairs to the Nicomekl gates were carried out at a cost of $6,260 and the Elgin Road project of 1921 amounted to $5,000. 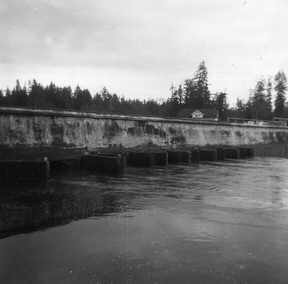 In April of 1922 part of the dam and road suffered a blowout requiring extensive repairs at a cost of $36,000. These costs were covered by the municipality which contributed $3,000, the provincial government which added another $3,000 and a $25,000 bond issue. On the left, the picture is taken on down stream side of the Nicomekl Control Dam. The picture is taken facing south and the Hadden home can be seen on the south end of Elgin Road. On the upstream side of the dam, the diver's service barge is in place. A temporary gate is ready to be lowered and will be held in place by water pressure while the gates are removed and serviced. The flood control gates were serviced annually. On the left, the diver is preparing to go down to pull the hinge pins to allow the gates to be raised for service. 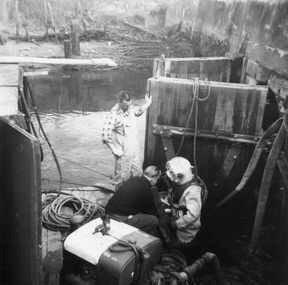 Ralph Summerville is assisting the diver while Duncan Hadden holds the gate in position. On the right, in the background Gordon Bishop is in the drag line raising a gate and in the foreground Bob Hadden is shaping toe pieces as replacement parts on the gates. 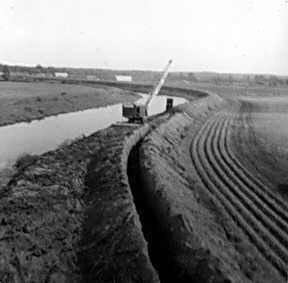 The development of the higher lands in the watershed especially with the urbanization of Newton, Whalley, Cloverdale and Langley caused an acceleration of the ground water flow down onto the low lands with resulting drainage and flooding problems for farmers in the area. The Commissioners of the Surrey Dyking District attempted for many years to secure federal funds, but without success until 1988. They also made many appearances before Surrey Municipal Council with briefs outlining the changes in water flow due to the new subdivisions. The large number of new homes built on former forest and undeveloped land resulted in a much faster runoff throughout the entire watershed. The silt brought down with the water gradually settled in the river beds. This made the river shallower and each year land owners found their land unworkable due to the standing water at or near the top of the soil. The growing season started later and ended earlier each year. To speed run off the Dyking District began a series of improvements to drainage canals. On the left, is the Burrows Ditch between 168th Street and 176th Street. The ditch is temporarily dammed and the pond in front is being pumped with two portable submersible pumps to lower the water level to allow the installation of the gates in the foreground. On the right, is the Serpentine diversion canal pictured looking northeast from 168th Street towards Fry's Corner. Gordon Bishop took this picture from the top of the boom of his drag line. 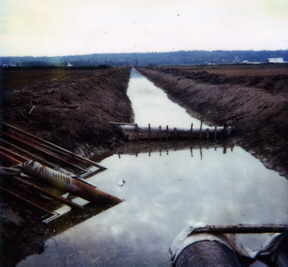 In 1957 the property owners in the Surrey Dyking System voted at their annual meeting to purchase a drag line and inaugurated a system on non-stop dredging and dyke building for both rivers. 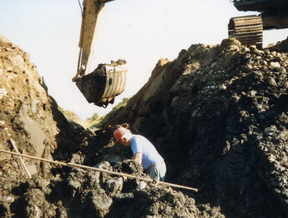 It was at this point that the Municipality started making annual grants to assist in the dredging costs. For some years now the District has operated two dredging units, plus a smaller core trench unit (which does custom work for the farmers on a contract basis). Gordon Bishop retired as foreman–operator in January 1992 after 35 years with the Commission. Henry Berge, operator–mechanic–handyman retired in 1994. These employees have contributed much to the success of the Surrey Dyking District through their field experience and extensive knowledge of both the topography and drainage technology. It took many years before the Municipal Council assumed any responsibility for drainage, but Surrey finally did establish a grant system payable annually to the three dyking districts: Surrey, Mud Bay and Colebrook. These grants have been increased in the past few years. In 1991 the Surrey Dyking District received $130,000. The availability of these funds, plus increased tax levies, and assistance under the ARDA Program have enabled the District to strengthen and raise the dykes, install flood gates, set up pumping units and therefore maintain a total flood control system so that the very valuable bottom land can continue to provide vast quantities of produce as well as milk and livestock for the city and urban residents. Drain boxes are vital to successful flood control. Upper left, a gradeall is clearing away the over-burden. Upper right, Gordon Bishop is checking levels to ensure the proper grade. Lower left, the gradeall is clearing out the ditch while Gordon is checking levels. 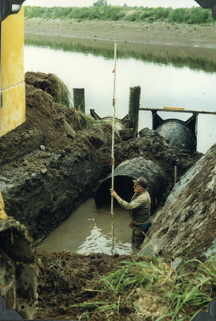 Lower right, the drain box gate is installed at the correct level and the pipe is installed back towards the field. Installation was always worked from the gate back to the field. 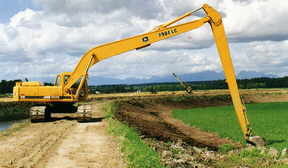 The City of Surrey is presently (2002–2006) working on a massive drainage project for the entire lowland area. It began in 2002–2003 with the building of the Surrey Lake to ease run off concerns from Bear Creek. The drainage project includes creating new or upgrading existing dyke, improved or new ditching and several new pump stations. This major project was necessary as run off from the Clayton uplands, the Sunnyside uplands, and the Newton-North Surrey uplands have increased as the areas have built up. After continuous or heavy rain, the water immediately pours off the higher ground onto the agricultural lowlands. The result was shorter seasons as the land was too wet to work in the spring, and inundations flooded the crops in the early fall. The City felt the massive drainage project was necessary for the well being of agricultural community. 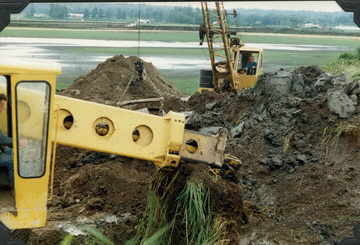 In the spring of 1993, the Commission purchased a new John Deere 790E long front excavator to replace an aging 22 B Bucyrus drag line. Ron Bishop, Gordon Bishop's son, says "The 790E does three times as much work as the old drag line and I am not worn out after running it for eight hours." The picture shows the 790E in the foreground and the old drag line in the background. The Surrey Dyking District currently has four paid staff, three full–time and one part–time. The Commissioners are paid an honorarium, for each meeting attended. The District performs custom work, pump station maintenance as well as taxation to offset costs not covered by the City.